The Green-Qube 60 measures 60cm x 90cm x 60cm, used horizontally it can comfortably house a 2ft T5 lighting unit along with the Rootit propagator. Comprising of 1 x main door, 1 x 4″ oversized extract port and 2 x outside passive vents with 700 microns bug-proof MicroMesh it creates a clean comfortable environment for cloning your prized plants of choice. The Green-Qube 60 measures 60cm x 90cm x 60cm, used horizontally it can comfortably house a 2ft T5 lighting unit along with the Rootit propagator. Comprising of 1 x main door, 1 x 4″ oversized extract port and 2 x outside passive vents with 700 microns bug-proof MicroMesh it creates a clean comfortable environment for cloning your prized plants of choice. Light is provided by 2 x 24w T5 bulbs which emit a soft, subtle white light ideal for young tender plants. 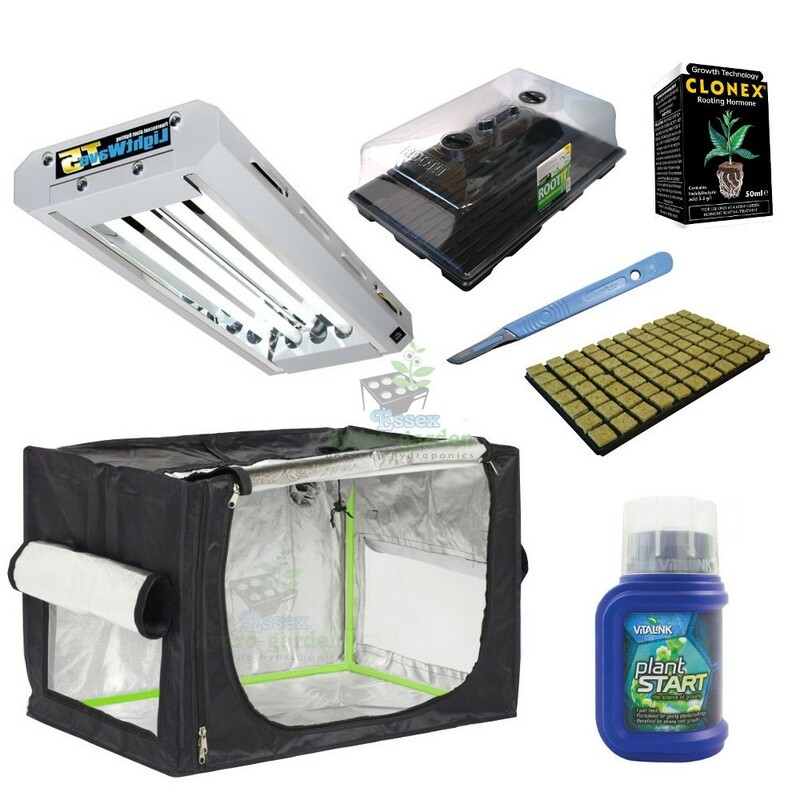 Also included in this kit is 1 x tray of 77 rockwoll SBS cubes for housing your newly taken clones, 1 x pH down to reduce the pH level of the rockwool cubes, 1 x scalpel for taking cuttings, 1 x rooting gel for dipping freshly taken cuttings into to help promote root development and also PlantStart which is to be used once roots start to develop as an early feed.